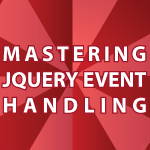 In this JQuery Video Tutorial I will cover numerous topics with a focus on Event Handling. If you missed part 1 check it out first JQuery Video Tutorial. All of the code follows the video. I also listed all of the JQuery Event Handlers and JQuery Event Object Properties below. Leave any questions or comments below. when I do this, it works fine! but when I add this ‘()’ after alertButtonClick, it alerts when page load. I don’t know why this happens. do you have any idea why when i copy this code to notepad++ it doesnt recognize the single column..
to make a focus event on the search bar display none the search button though it doesnt seeam to work – do you have any idea why? You are not providing that even above. Please discuss more about fancy-box. I need more video about fancy-box. i.e. input-able fancy box.